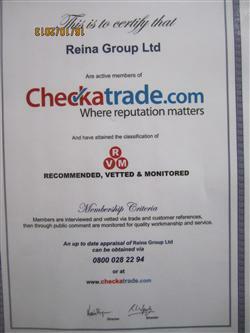 Reina Group have recently joined the Checkatrade membership to inform consumers of their growing reputation within the heat pump installation sector. Reina Group in partnership with Checkatrade can reinforce its status within the market place and show potential clients how we have performed locally to the satisfaction of others. Customer feedback forms can provide a service to companies so long as they don’t “cherrypick” the best testimonials to advertize and act upon negative criticism but with Checkatrade it is totally independent feedback where the client feels open to give an honest opinion. We strive to continually improve our customer service in this demanding industry and hope to benefit from this new relationship by showing clients a true reflection on our ability as professionals within this sector and our trustworthiness.